Spring is a wonderful time to awaken your child’s speech and language skills. The days are getting longer, the temperature a little warmer, and the earth a little more inviting. Take a Walk. Point out the things you see around you. Make it a “scavenger hunt” of sorts by naming everything of a certain color, or that begins with the same letter. Modify this activity based on your child’s age, interest, and progression with speech development. Head to the playground. Bundle up if you have to, but make an effort to get your child on the swings. There’s something to be said about the idea of vestibular stimulation, the back-and-forth swaying of the body that taps into the speech and langauge center of the brain. Practice target words/sounds/phrases with each push. Try reciting the ABCs with yoru child. Have him repeat as best as he can with you. Ask yourself: have you ever heard a quiet playground?! Water and sand play is great for speech and language development. Look into sand and water tables at various stores where they sell children’s outdoor/sports toys. Drive matchbox cars around the table, pour water, talk about the texture of sand (smooth, rough, gritty, wet), and water (cool, warm, wet). Ask your child about cause & effect, “what happens when we…?” (not into the mess of real sand? Many new sand-like compounds are now on the market. Look for them at Michaels and Brookstone). Create an obstacle course on your driveway or patio. Use sidewalk chalk and develop hop-scotch, a bike riding station/course, hop on a scooter, wiggle a hoola-hoop, blow bubbles, create a relay race from one end to the other. Oh–and while your child does all of this, ask her to say a target word/phrase/sound. More nature-inpsired speech-langauge ideas and activities coming next week! Tomorrow: Children’s books about books! Later: Children’s books about spring. Special Upcoming Guests: Dr. Diane Dynes and Kelly Donovan with their NEW music CD “Talking Tunes” interview & Give-a-way. Stay tuned!! Last week, we were introduced to the lovely Michael Hingson, a man who has been blind since birth. He and his guide dog, Roselle survived the 9-11 attack by running down 78 flights of stairs to their freedom. 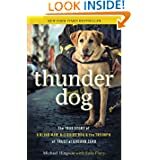 While he has written a bestselling adult book based on his experience (THUNDER DOG, 2011), RUNNING WITH ROSELLE is designed for independent readers, ages 8+. Oh my gosh! What an adorably touching story about the bond between man and dog. RUNNING WITH ROSELLE by Michael Hingson is truly a book for kids with a soft soft for humanity and animals alike. We started reading this to our 7 year old and 8 year old girls at bedtime. (It’s a chapter book designed for indendent readers 8+ years). 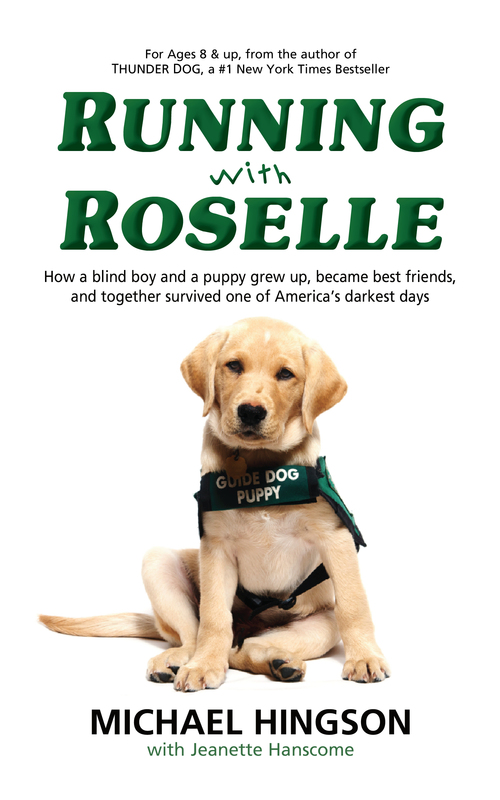 Told from alternating points-of-view in Roselle’s voice (guide dog puppy) and her human, Michael (blind since birth), it truly touches the spirit. Meet Mike as a young boy (about 4 years old) as he is raised by his parents in Chicago after first, later moving to California. Mike was born premature and because of the added oxygen to his incubator, he became blind. While others suggested he’d never be able to live a full life at home with his family (this was in the early 1950’s), his parents refused to institutionalize Mike. Through a series of hard-knocks, we learn just how challenging a “dark life” can can be. But this man has grit! Alternatingly, we learn about guidedog puppies, how they are bred, trained, and raised. It’s truly eye-opening. Told in such a charasmatic manner, with active scenes that engage even the youngest reader–and adults alike, this book is such a joy. Incorporate it into your reading routine with your family. I guarantee it will touch you all. Talk about what it means to persevere. Share examples with your kids times when you had to persevere. Ask them to share some of there experieces as well. Remember, it’s all relative. What seems to be easy for you, may really be challenging for your child. (Examples: learinng to read, ride a bike, stick up for oneself, complete a degree/college/grad schoool). Ask your kids open-ended questions: 1) What is better to be smart or to be a hard-worker? 2) Persistence or Luck? 3) How would you get through life if you had a handicap like blindness? Augment this book with something like the story of Helen Keller. There are some kid-friendly versions of this classic tale of one woman overcoming the odds to be her best self. Donate RUNNING WITH ROSELLE to an animal shelter. Visit with the staff and dogs. Is there a guide dog training club in your area? Can you attend one of their meetings? Look into your local area and see if there is a school for the blind you could tour. Take your children. Donate the book. Consider having your dog become a therapy dog. * Note, this is different than a guide dog. Therapy dogs are often very laid-back and people-friendly. After training and certification, they are able to visit hospitals, nursing homes, or be reading buddies at libraries. Thank you ALL for your touching comments about your first reactions to your child’s apraxia diagnosis. Wow, I am utterly amazed at the devotion pouring forth in your words. One lucky momma will receive this lovely apraxia necklace from Handmade Love Stories…and the winner is….JENNIFER H.!! 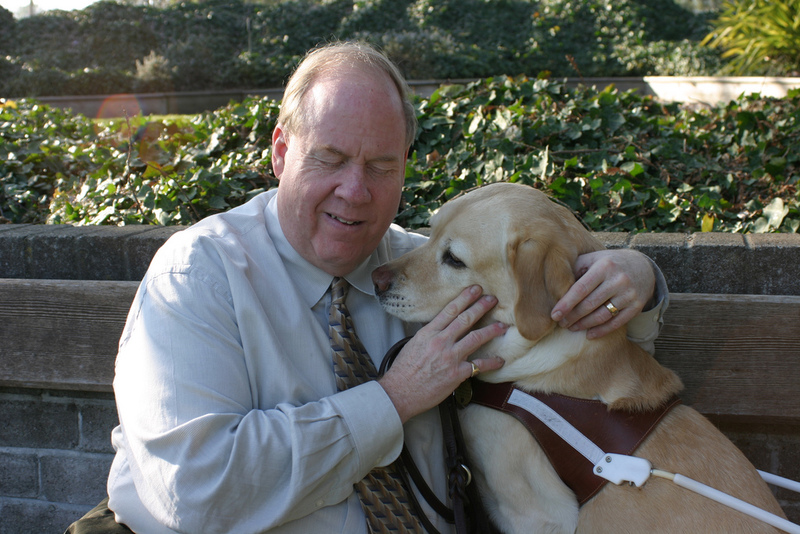 Blind since birth, NYT bestselling author Michael Hingson escaped from the World Trade Center by walking down 78 flights of stairs with his guide dog, Roselle. Here, he shares his thoughts on the age-old question, “Mom, can we get a dog?” I love this man, his dog, his message of triumph. Next Tuesday, I’ll review his new book, RUNNING WITH ROSELLE, a heartwarming and incredibly touching story of man and dog on 9-11. 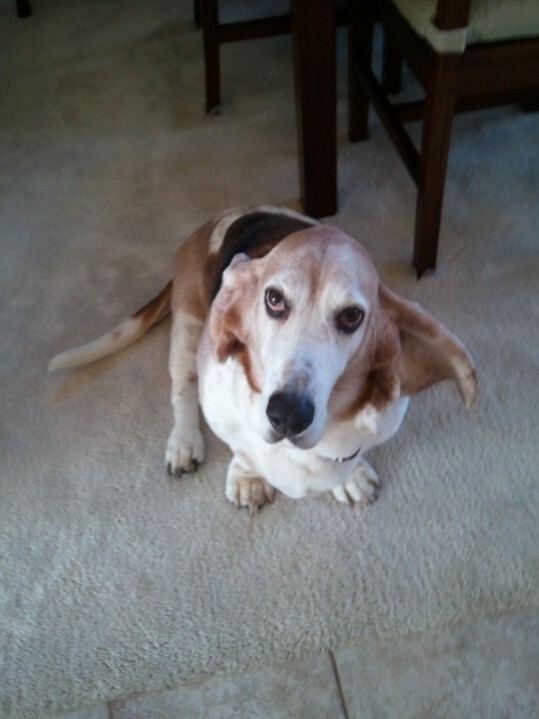 A dog is a lot of responsibility and it can require a fair amount of work for family members. 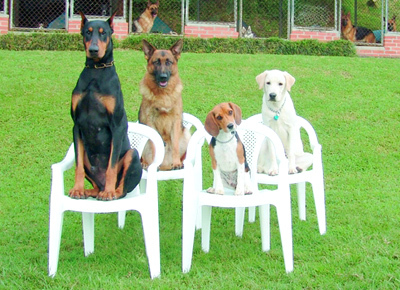 Often training is involved, but much of the time humans need more training than dogs. There are costs associated with owning a dog. A pet dog is not for everyone although a dog will enrich more lives than most of us imagine. Owning a dog is best described as making a lifestyle choice. Having owned and used guide dogs for nearly fifty years I have come to know the significant part they have played in my life. I have seen wonderful and focused guide dog users, and I have seen those people who never should have gotten a guide dog at all because they did not learn how to establish a relationship with their dog. I have seen good pet owners and I have seen poor ones. Again, the key is to establish a good strong interdependent relationship. Most important of all I have seen the positive effect a dog has on children who have had the proper exposure to a dog whether it be from the good casual encounter with a dog such as mine or a good experience which stems from having a good pet owning experience within their own family. Let’s look at the five points I raised above and see how a dog might be right for you and your family. I said that dogs require a lot of work. If you are going to own a dog, you must make your home a real home for the dog as well. Any dog needs its space and it will have its favorite toys and bed, or it should have them. Dogs like to know what belongs to them and they also like to know the rules of the house. Dogs are pack animals. They will learn to look to humans for direction if we lay the ground rules for the relationship from the beginning and are consistent. As the pack leaders humans must also be the team builders, the leaders. Whether an assistance dog or a pet, the dog will take direction from us if we are open to learning how to give clear direction and if we learn how to establish effective two-way communications with the dog. If you have children they MUST be an integral part of this process. Many guide dog schools allow children as young as nine years of age to sign on as puppy raisers for their future guide dogs. The children learn to accept this responsibility and take their job seriously. I have seen very young children be good pet owners and work well with their dogs. The dog, for its part, learns to obey the child just as it does the parent. I mentioned above the idea of dog training. Good trainers will emphasize that training is at least as much for pet owners as it is for the dogs. 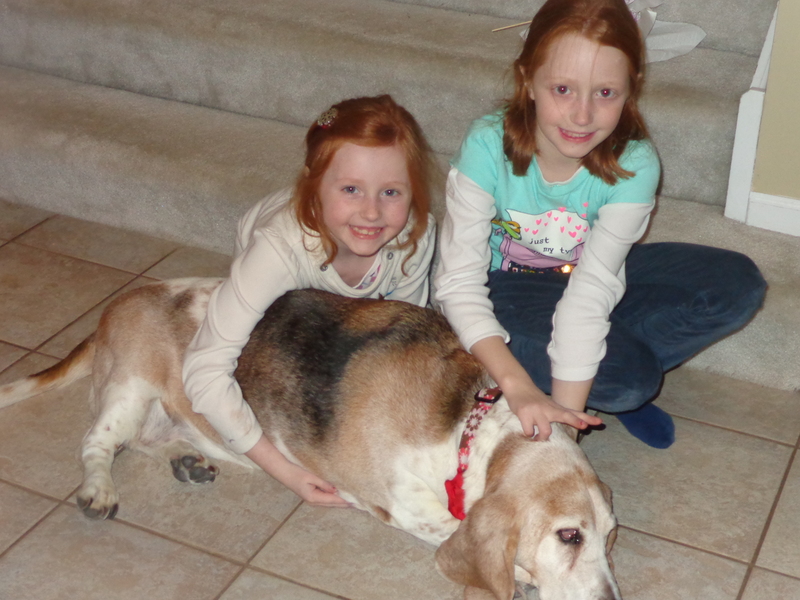 Pet ownership is an adventure for children who are given the proper expectations by their parents. They get quite excited as they see their pet dog grow and learn because, in fact, they are growing and learning themselves. While we may want our dogs to learn to do tricks, obey our commands, and assist us in performing tasks, again, we must learn how to communicate with them and we must learn what will motivate dogs to positively respond to our wishes. As children learn how to communicate and train their dogs they are rewarded by the positive responses of their pets. It all begins with parents learning the ropes and then passing this knowledge on to their younger pet handlers. I urge potential and existing dog owners to learn about clicker training and food rewards. One book I recommend is “Getting Started: Clicker Training for Dogs” by Karen Pryor. Visit Karen’s website at http://www.karenpryor.com. Dogs are not usually extremely expensive to own. The rewards far outweigh the costs. Unless a dog has serious medical issues, feeding a dog should not cost more than $50 a month. Well, it won’t unless you choose specialty or very expensive food. Most dogs do not require expensive specialties. There are many good dog foods on the market, which are created with all the nutrients and ingredients they need. I use a high-end dry food or kibble. It costs me about $30 a month to feed my guide dog, Africa. Feeding a pet is a significant responsibility, which children can learn to handle. Of course, kids will forget or sometimes want to do something else when they should be paying attention to the dog’s feeding schedule. Emphasizing that food time is important to children as well as to the dog will help. “When you get hungry you want to eat, right? Well, it is the same for your dog except he or she can’t raid the cookie jar like you can. Your dog depends on you to give it dinner.” Use positive methods to teach your children and you will quickly see how they catch on. You will also get a happier and more involved dog. Vet bills can mount up when there are serious illnesses. However, devoted and engaged dog owners will say that they will do whatever it takes to keep their fur-covered friends healthy, especially since the dogs are part of the family. Even when a dog becomes ill involving your children is important. Always be honest with them about what is going on with the family dog. Children often observe more than we think and they understand more quickly than adults what is going on in times of illness. Always let your children be curious and do your best to satisfy their curiosity. There are people who will never have a dog in their life for one reason or another. I will not judge the merits of such people’s viewpoint. Instead let me say that people who choose to adopt the dog owner lifestyle and let animals enter their lives often say that deciding to have a pet dog was one of the best decisions they ever made. Not only do dogs love unconditionally, but they teach us responsibility. I have talked with many guide dog puppy raising families who tell me that having a guide dog puppy in training, even if only for a year, taught their children responsibility, how to love better—beyond themselves, and said the dog brought the whole family together in ways nothing else ever could. I have talked with adults who have been involved in raising guide dog puppies all their lives. Many of these adults continue the puppy raising family tradition and love it. They also have other pets that are obedient and engaged. These adults also say how much they learned about life, commitment and responsibility from their puppy raising experiences. I call owning a dog a “lifestyle choice” because that is exactly what it is. Owning a dog will mean taking on new obligations and responsibilities. It will require learning to communicate with a creature that does not think, act, or operate the way you do. If you and your children learn, as the dog owners, how to approach ownership correctly you will most likely find that all of you take teamwork to a whole new and higher level within your family unit. The upside to taking on these responsibilities is that you will make a friend in your dog who will love you like no one else. The whole family will have a new colleague. One who will open new doors of friendship and conversations with humans around you; providing positive opportunities you may not have ever experienced before. The entire family will have fun. And most important, I think the entire family will find that, no matter what, the family stress level will go down because when any of you begins feeling like the world is spinning out of control suddenly a cold wet nose will push an arm, a warm head will land in an lap, and your dog will look and say with its eyes and tail that “Everything is ok because I am here and I think you are wonderful.” What can be better than that? I invite you to visit my web site to learn more about my life with my guide dogs. On the site I have placed articles I have written about my training experiences with Africa. You can also read about my story of escaping from the World Trade Center with my guide dog, Roselle. You can even purchase books that others and I have written about my experiences. You can purchase an artist’s portrait of Roselle painted by the world’s foremost animal artist, Ron Burns, to help support “Roselle’s Dream Foundation” which was formed to help blind students offset the expenses of purchasing specialized technology. If you have questions about dog ownership and training, feel free to email me at info@michaelhingson.com. Go find the right dog for you and your family. You will be glad you did. Who are you, really? Okay, I don’t mean to get all personal and philosophical on you, but have you ever really stopped to think about who you are to your child with apraxia? You’re a lot, that’s what. Some days you may not feel that way. I understand. I’ve been there. Kate is now almost 9 years old and in 3rd grade. Sure, we have good days and bad, but the apraxia stuff is mostly behind us. In our darkest days, I was a failure. Apparantly, I failed to do all of the ‘right’ things for my daughter. Because I didn’t take her to mommy & me classes she wasn’t socialized properly; that’s why she had apraxia. I must not have talked with her enough as a baby, either because she never really babbled. Yep, I was a failure. At one point, I even asked my husband if Kate and I had bonded properly in the hospital. Because, in my mind if we hadn’t bonded, it was no wonder she was just grunting and pointing instead of using her words. And then the sun started peaking out from behind the clouds. Kate said a few words. She began stringing them together. She told us she loved us and how we giggled and rejoiced. Something was happeneing. Her apraxia was improving. No longer a failure, now I was somehow a martyr. Others congratulated me on what I was doing. Nothing. I didn’t think I was doing anything but schlepping Kate to and from speech therapy, greeting her at home from her 1/2 day preschool, and providing educational enrichment activities, crafts, games, books. But Kate was improving. And so I continued. Like you, I scoured the Internet for scores of articles, ideas, tip, discussion boards, blogs, programs, camps, therapists, groups and anything else I thought may help my daughter. My eyes grew salty, tired, and weak. My head filled with strategies and words I never had heard of. But I persisted. You, too can add ‘persistent’ to your name badge. But deep down inside I was still just me. First a daughter. A little girl. Then an adult, a woman, a wife. A nurse. Eventually, I became a mother. And when my first baby didn’t talk, I became worried. Remember the feeling? And then I was frustrated. Why? How did this happen? What can I do? Why won’t she talk? She seems to understand everything just fine. Frustration turned to anger. Who was I angry at? 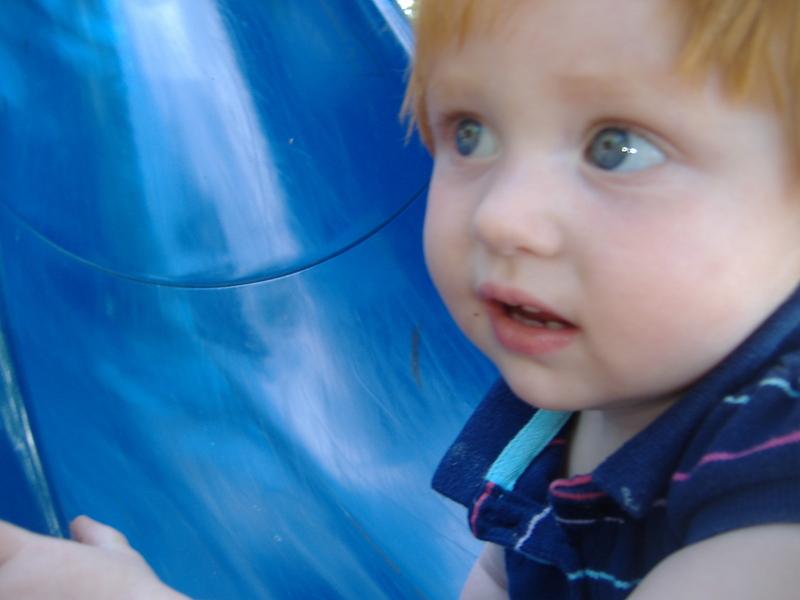 Certainly not my cherubic redhead with eyes-oh-s0-blue. She’s just a little girl who can’t talk. And not my doctor or my SLP, they were there to help. My husband was supportive and so were Kate’s grandparents. I was angry that this had to happen in the first place. It’s not fair! I wanted to scream. Oh, what’s that? You felt angry, too? I understand. When Kate graduated from her 5-days-a-week speech-based preschool, we rejoiced. We had a party, if not for her but for her family who had walked the apraxia path along with her. Cake, gifts, friends…it was a bittersweet beginnng of a new era: recovery. We weren’t out of the woods just yet. There was still a good deal of work to be done to get Kate ready for kindergarten: phonetic awareness, social skills, reading and comprenshion, etc. And then this tiny little thing called AD/HD slipped into the picture. Actually, it was there all along. The difference now: Kate was old enough to be formally tested and medicated. Meanwhile, I kept on with the things that made me happy: reading for pleasure, crafting, writing, spending time with friends, going on dates with my husband. Because, I knew I was more than a mom. So while you may be raising a child with apraxia and this is a big part of your identity, remember to keep your life balanced. Wear your badge with honor, apraxia mom/dad/grandma/grandpa/aunt/uncle. But know, too that are you are MORE. 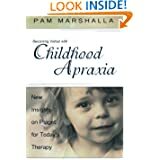 For more information on family coping/parent coping with childhood apraxia of speech (CAS), please refer to the 2012 Award-finalist SPEAKING OF APRAXIA (Woodbine House) book available on Kindle and paperback thru Amazon, Barnes & Noble (in-store, and on-line) as well as on the publisher’s website, www.woodbinehouse.com. Thanks a million for ALL of your great comments on “What I’d wished I had known about apraxia before [my child was diagnosed].” Love hearing your thoughts. 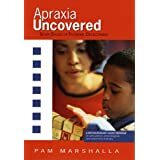 Kristin will receive both of Pam Marshalla, CCC-SLP’s books on childhood apraxia of speech (CAS).